Thank you for your kind and constructive comments. I think you are both right with regards to good ballasting and track weathering - I guess it's a bit like tiling which only looks good once the grout has been applied!! On that basis (and I won't hold you to account if it doesn't work out ) I will continue down the line of using the Peco track and point work for Denesport but perhaps look to have a go with hand built for the future Lesley Falls module. No further build this week - it seems I have to go shopping on my birthday!!! you're off to a good start, keep it going. I didn't realise it has been dismantled? All looking good for the long awaited move then? A bit of time between the last post and now however there has been some movement on the layout. On the basis of continuing with Peco code 55 I marked out the boundaries of the track bed onto the foam surface around all lines and then removed the trackwork. I then used tissue paper to pick up the boundaries and then used this to mark and then cutout the trackbed (3mm cork sheet from that well know swedish shop!!!). In between this I also laid down some thin plaster work to provide a flat surface (oh for a N Scale Lazer Dozer!!) - This was necessary because i had used individual pieces of foam instead of one large piece and some "shrinkage " had occurred and i needed to level out the joints. One thing i did note, and i hope will not cause a future problem is that having used felt pens to mark out the track plan this has leeched through the plaster (it is a relatively thin layer of plaster) - i imagine that once i have ground cover down this wont be seen. Once sanded smooth and reasonably level (noting that this is N scale and thus a small bump in HO is tantamount to hills in N I dry laid the cork and have relaid the trackwork noting that none is cut and joined as final. There is an intentional rising gradient heading west (to the left) but this is minimal. I am also looking at lifting the main line above the passing loop however given that the loop is no more than 2'6" long Im wondering if it is worthwhile - something to play with before final fixture. I now need to make up my mind with point operation and then finalise the wiring - im still deciding on DC or DCC or better still (if it can be achieved) both. Any thoughts on either topic anyone? Lifting the mainline can look good, it only needs to be a bit, I raise mine (HO) by layer or two of card, it is surprising how noticeable it can be. Here is 23rd Street's curve the main (middle track) is raised and super-elevated, the siding (right track) is starting the climb to meet the main just in front of the cars, the card further back was to level the board. Personally I would go DCC, especially if you are considering sound (more and more possible in N), it makes a huge difference to switching in my opinion. Plus lights can operate prototypically. The wiring is simpler if you plan to have more than one loco on the layout at a time, no blocks or isolation sections. 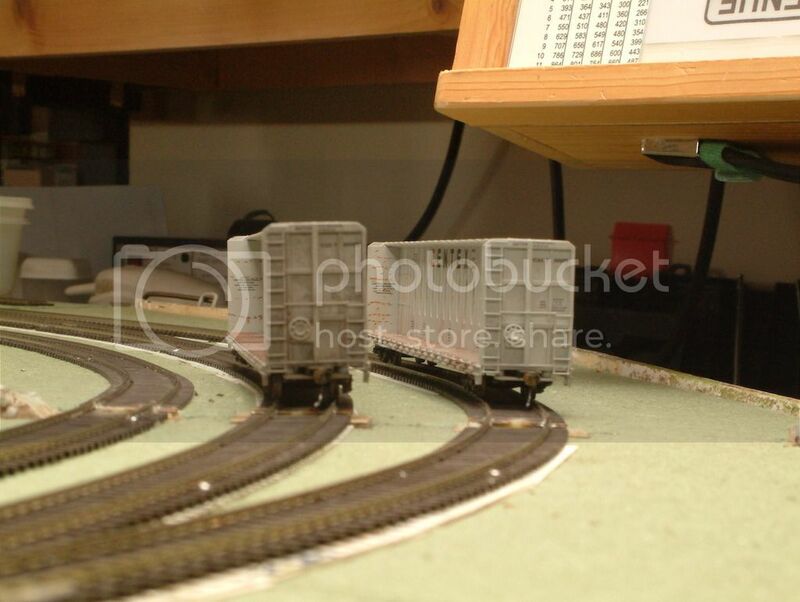 With a few locos the cost of decoders is not too bad, a starter system would be enough for this layout. I would go with either manual point operation or locally operated point motors. I don't find DCC points are that useful unless they are to be controlled from a computer panel, too much button pressing. I did on 23rd Street because I didn't have time to build the local controls and already had the decoders, I'm now going to be putting non-mainline points on switches. Completely agree with Mike - DCC is the way to go. You'll only regret it a couple of years hence if you don't do it now. And before you start to add too many locomotives. [quote="BrianMoore"]Completely agree with Mike - DCC is the way to go. You'll only regret it a couple of years hence if you don't do it now. And before you start to add too many locomotives. Too many locomotives may be a bit too late - still at least I have a few to practise on!! I have a Prodigy Express system as well as a trusty "clipper" and a gauge master twin so ready to operate in either camp although I do feel as though I ought to go DC first - call me old fashioned or something else! I'm thinking that the size and shape of this layout will only really support two loco's running at the same time (assuming a meet) with possibly a third (local shunter) sitting in one of the sidings - it would be the range of "passing thru" freight and passenger trains as part of the timetable that would add decoder costs but with age 60 next year and a reasonable pension lump sum on the horizon this may not matter!! My preference at the moment for point operation is servos and micro switches with perhaps a "Megapoints" unit to control them all - a test bed is planned to try out this method (before buying the unit) as well as hard wire operation. This may start some controversy, perhaps we should move it, but the two (DC and DCC) are not mutual exclusive. I do not know how you are wiring your blocks but leave one connection free for future DCC. Remember also that most DCC systems allow you to run one DC train. The big NO NO is to leave it ticking over on DCC. I like a good debate!! The proposed train operation (one or at max two operators) would consist of trains coming in top left and / or top right and either stopping (meet or otherwise) or simply passing through. Freight would occasionally drop off or Pick up Box Cars for / from the various industries (situated on the spurs). When there are no passing trains on the main then shunting would occur from / to the various spurs. Effectively each spur would be electrically isolated (by way of physical toggle or other switch if using DC) from the main / passing loop due to the use of electrofrog turnouts. There is some potential for limited movement on some of the spurs while the main is in use. What i'm after is the simplest wiring solution (if it exists) to operate in DC and DCC but not at the same time. - For this scheme, at this time i'm not planning on DCC accessories for turnout or signal operation. Peter meant that if you installed cab control blocks (blocks that can be connected to several cabs) DCC could be connected as another controller. But it is not a good idea to have the possibility of both types at the same time so it is just as easy to make it so that either the DC or DCC power is plugged into the layout. If you go straight to DCC then there are no blocks to worry about, just connect all rails to the power! For DC with two trains you would probably need about 5 to 6 blocks and even then there will be restrictions on where the two locos can be at the same time, that is another great thing with DCC, locos can drive up to each other on the same track no restrictions. If you do go DC I would suggest double pole centre off change over switches (DPDT Centre Off), that would give either of two controllers and fully isolated. Mike_R wrote: If you do go DC I would suggest double pole centre off change over switches (DPDT Centre Off), that would give either of two controllers and fully isolated. OK I would do what you suggest and one has two "Throttle Buses (left and right) and one DPDT per block (there are only 4). Remember Dean has a stable of unclipped n gauge locos. Then if and when the time comes to go DCC disconnect one bus (if one must, I am not entirely convinced and would tend to leave one connected to DC) and connect the other to DCC. Unclipped locos can now be isolated (centre off) and run on slot 0 (I think that works on most systems). Oh and most chipped locos can be run on DC if so programmed. Dean, I am sure Mike can provide a wiring diagram for his DPDT switches. The effort in converting that to DCC is minimal. But I would certainly aim at having some DCC locos eventually. You really don't want dc and DCC on a layout at the same time, if they get connected together (a loco or piece of stock bridges two blocks) one or both may be damaged. I would have a power plug that connects the layout to the power source. With a matching socket on both the dc and DCC power units either can be simply plugged in depending on which is required. This bears out what you say, but Lenz for instance used DC on the tracks to initiate a slow down. However, Yes unplug the two DC throttles from the bus and plug DCC into one. Or use a TPDT to do the same thing? You can also do braking on decoders with ABC (many European makes) by inserting diodes in the track feed, I had thought of doing this for 11th Avenue if it had done exhibitions, for automatic passenger running. Still this is all too complicated for a simple switching layout such as Dean's, keep it simple, cheap and easy. All that is needed is a 4 way plug and socket arrangement (3 if using common return on the d.c.). Connect both d.c controllers to one socket and the DCC unit to another, connect the layout track via block switches to a single plug. Then plug in which ever control system you want to use, for DCC set all the block switches to the controller side it is connected to, they still allow you to "shut down" locos if sound fitted. Many DCC decoders will work with d.c. (especially those sold pre-fitted in locos), that gives another option. They will start at a higher voltage and may not work with pulse controllers. You did say there may be a bit of a debate!! A bit busy in the paid community so havent been able to catch up although some reading behind the scenes and a bit of designing the wiring has taken place. In consideration the design is based on the base need for DC together with frog switching for the PECO Electrofrog points. There remains a consideration for switching to DCC as and when desired so I'm hoping that ive got it right - Im thinking a pair of "banana sockets" - connected to the block switches which will allow DC or DCC controller to be plugged in and then operate the Block switches accordingly. All constructive comments welcomed (if you can read the diagram). One thing i did read (just before Peter commented) which I did'nt realise, is that most DCC Locos will work on DC by simply changing the loco address (0000 or other) - ive not tried it out yet but it does alter the purchase strategy for the future (DCC with or without sound as long as i can afford it). I have also set too making a test bed for point operation to try out the options - ive now got 0.6mm Piano wire to use with a Hobby King Servo as well as a Blue Machine to try out. Ive also got seep and peco machines which i will try - it will be interesting to see what performs best driving through some 60mm depth of ply, foam and cork!! I've also had a go at melting plastic (I mean soldering!!) and using the hobby tool to make the breaks in the switch rails - all for the benefit of not having to rely on switch blade to stock rail contact. A Cyril Freezer book provided the simplest explanation - there is an awful lot of videos and "tutorials" on the web with most of them quite confusing. Many thanks for your excellent advice - il take a look at the links youve posted and see if can get further confused! !